Dads are always there—helping with homework, giving rides and advice, and so much more. Father’s Day for kids is a special opportunity to show Dad how much he means! Homemade gifts for Dad are his favorites, and offer Father’s Day activities that the whole family can enjoy with Dad. 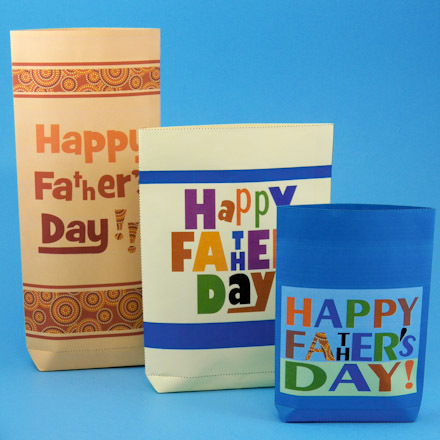 See the Father's Day Crafts for Father's Day cards, bags, gift boxes and wrapping paper. Find some fun homemade Father’s Day craft ideas below (and remember—Mom, Grandma, Grandpa or Aunt and Uncle might like them too!). Crafts marked with Friday Fun are great for classroom or group craft time. The projects range in difficulty from VERY EASY to AVERAGE. Pictures say more than words, but pictures and words together will help you decide which of these fun and creative Father’s Day craft ideas to make for Dad this Father’s Day! Leather Keychain Fob - In this project, make a keychain fob from a scrap of leather and decorate it with makers or leather cutouts. This is very easy leather craft project that uses simple materials and is suitable for beginners and children. Makes a great gift for Dad! Bath Buddies - In no time flat, you and your kids can make soap buddies for Dad! Kids of all ages enjoy the squishy fun of making little soaps in a variety of shapes and colors. Shape them into balls or create cute shapes with soap molds. Add some string to make soap-on-a-rope. Tangram Puzzle Boxed Set - What could better than a beautiful gift that is easy to make and the whole family can enjoy playing? In this project, you'll make four tangram puzzles and a matching box for storage. Make one for Dad this Father's Day! Stenciled T-Shirts - It might be a little fishy, but Dad will love this wearable homemade Father’s Day gift. 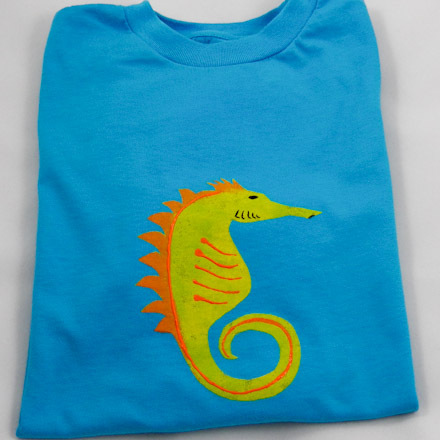 Fish and seahorse stencils will have kids imagining a deep-sea dive for buried treasure, while Dad will treasure this shirt for many beach trips to come. You can also use your own store-bought stencil of one of Dad’s favorite things! Pencil Toppers Friday Fun - Show Dad he’s tops with a thoughtful, creative pencil topper. This homemade Father’s Day craft will remind him how much you love him every time he writes a note! The craft project includes suggestions for silly, funny and heartfelt pencil topper gifts to make for Dad using Aunt Annie's Homemade Modeling Dough. Flexagons - Dads are great at solving puzzles. How else could they help with confusing math assignments? This handmade Father’s Day toy will be a great escape for Dad when he needs a break. Flexagons are folded paper polygons that can shift from color to color just as quickly as Dad can pick you up and swing you around. This is project in the series, Geometric Toys to Make. 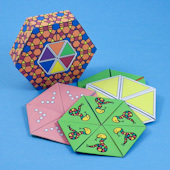 Flexagon Boxed Set - Make a gift that will fascinate puzzle-minded kids and adults. In this project, you'll make a set of hexaflexagons and a matching hexagonal box for storage. Flexagons are folded paper polygons that have the neat feature of changing faces as they are flexed. The Game of Achi - Achi, a board game from Ghana, is a great Father’s Day activity for kids and the whole family! Dad will love a handmade Achi board made with either felt or paper as a Father’s Day gift, and you can spend hours together playing this entertaining and easy game. Ring Toss Game Friday Fun - Head outside with Dad this Father’s Day for an exciting game of ring toss, using Dad’s very own homemade gift set! It’s a fun and functional Father’s Day craft activity that can be played outdoors on the lawn, or indoors on rainy days. Rules are included, so you, Dad, and the rest of your friends and family can play with this Father’s Day craft any time of year. Hand-woven Bookmarks - Dad can save his place in style with this handmade gift for Father’s Day. A handwoven bookmark is easy to make, and it’s one of Aunt Annie’s favorite Father’s Day craft projects! If Dad is more of a coffee drinker than an avid reader, just increase the loom size to make him a special cup coaster. 3D Refrigerator Magnets Friday Fun - A great activity for Father’s Day, 3D Refrigerator Magnets provides kids with a fun craft project that Dad will love. His handmade set of plaster of Paris magnets can decorate the fridge, a file cabinet at work, or any other metal surface. Make him a special Father’s Day card for the magnet to hold! 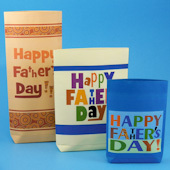 Tip: For Father's Day crafts, including cards and these gift bags, see the Father's Day Crafts roundup. Dads who like puzzles and games will love Flexagons, folded paper polygons that have the neat feature of changing faces as they are flexed. Make Dad individual Flexagons and Hexa-hexaflexagons or make him a Flexagon Boxed Set. 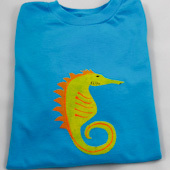 Wouldn't Dad look great in a T-shirt stenciled with a fish or a seahorse?